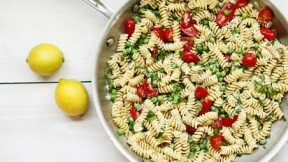 Put some lemon cream sauce on pasta with this recipe from Alice Currah of SavorySweetLife.com. See the full post at Kitchen Explorers. While pasta is cooking, heat the olive oil on medium-low heat. Add the garlic and allow the garlic to lightly cook for one minute. Add the lemon zest and cook for an additional minute. Stir in the heavy cream and the peas. Cook the cream sauce for 3 minutes and turn off the heat. When the pasta is done cooking, drain the pasta and add it to the pan with the lemon sauce. Add the tomatoes, basil, and lemon juice. Gently toss all the ingredients until the sauce is evenly distributed. Season with salt and pepper if needed.